I picked up Bug from camp this morning, and she heads back tomorrow. Of course, that means that we’ve got about 24 hours for the insanity of washing all clothing and bedding, just to repack it all for tomorrow. And, this means that Miss Bug must catch up on her chores and work on her room. Thankfully, we seem to be doing pretty well. Unfortunately, this has left very little time for spinning. However, I did have a brief half hour to spin on the porch with my coffee this morning. So, I’ve got a progress picture. Hopefully I’ll have more spinning time tomorrow. And, maybe I can finish the first half of this current project. 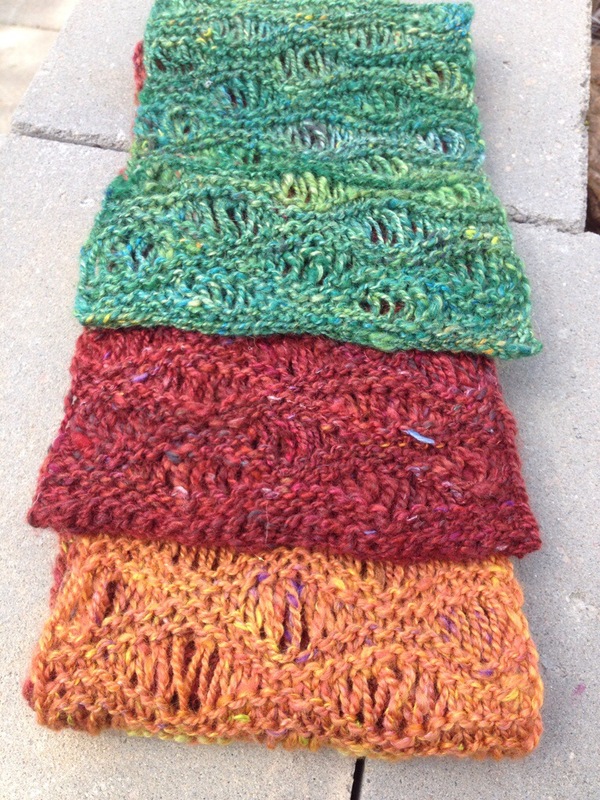 I loved my first drop stitch scarf SO MUCH! 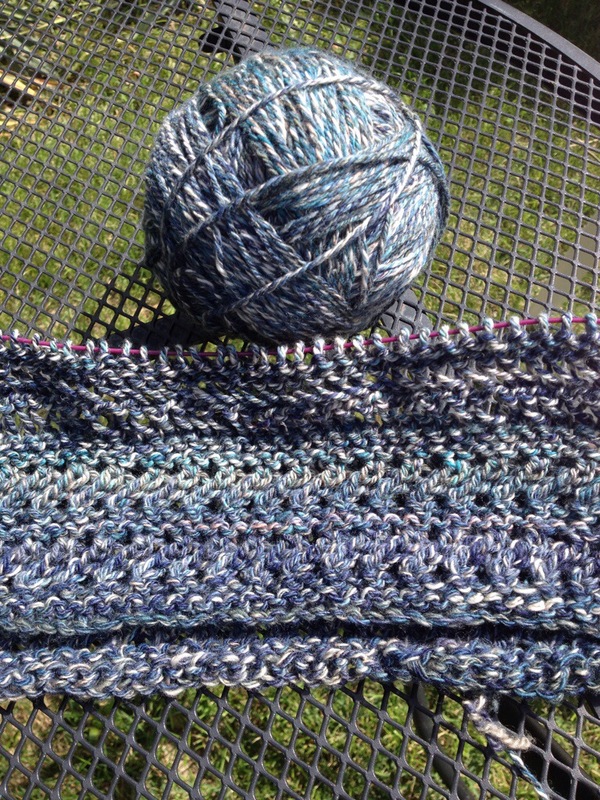 It was gorgeous, and a fun knit, so I cast on another, out of handspun inglenook batts. 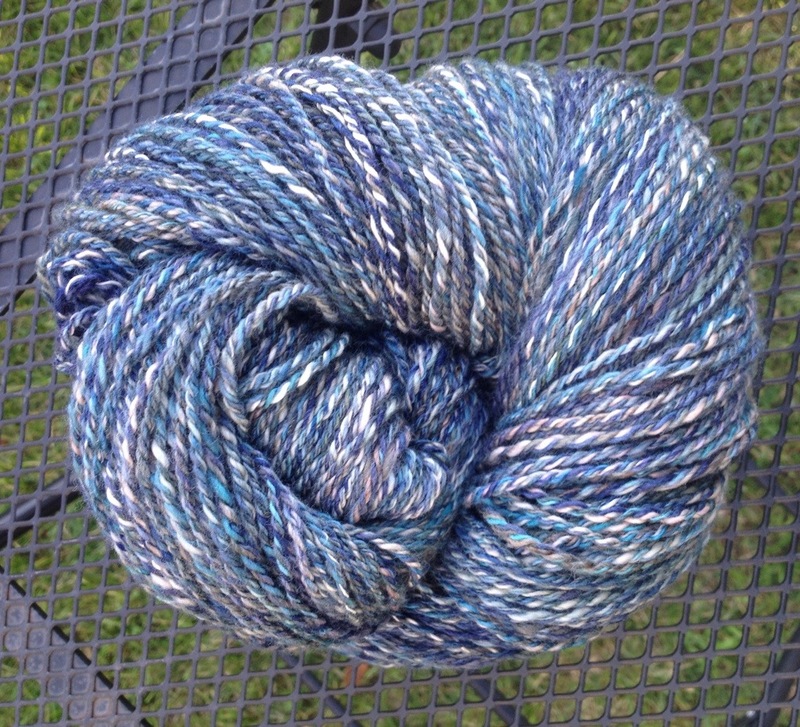 The handspun yarn is a 2 ply gradient. Some of the color transitions were very gentle, others a little abrupt. However, the scarf is beautiful and soft and lovely, and has the characteristics of the batt it was made from. So it’s all good! 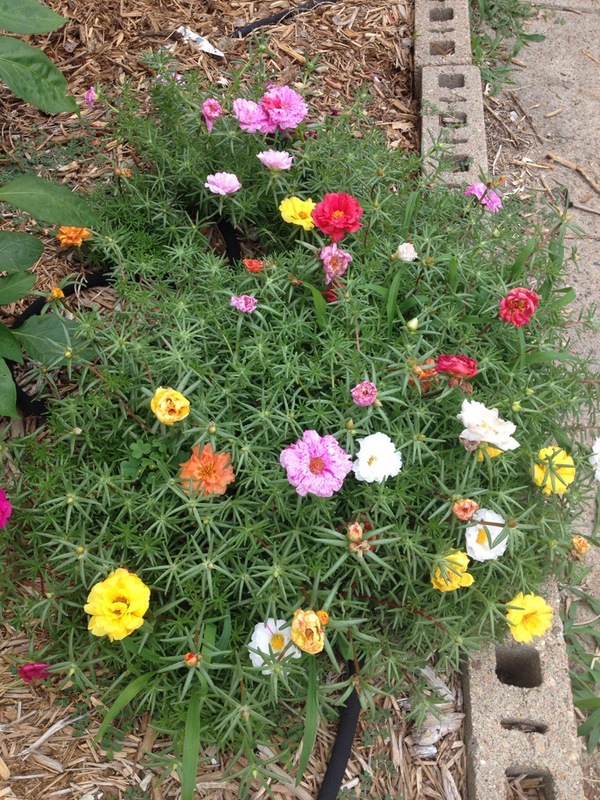 Speaking of color, my moss roses from last year reseeded in my garden. Last year we had orange and pink. So it was a great surprise that when they came in this year, we had all of the colors! It’s the time of the year here when the garden grows like gangbusters and that’s a fun time for me. I’ve got tomatoes coming in, and it turns out, a reseeded tomato plant too. It just came up! I’ve got tiny eggplants that I need to get a picture of, and my herbs are amazing and beautiful. The one thing disappointing is that one of our storms took out the majority of my cayenne pepper plant. The cayenne pepper plants are my favorite every year, so it was very sad to see it cut so far back, and I am going to have to wait a lot longer for my peppers. I miss them! 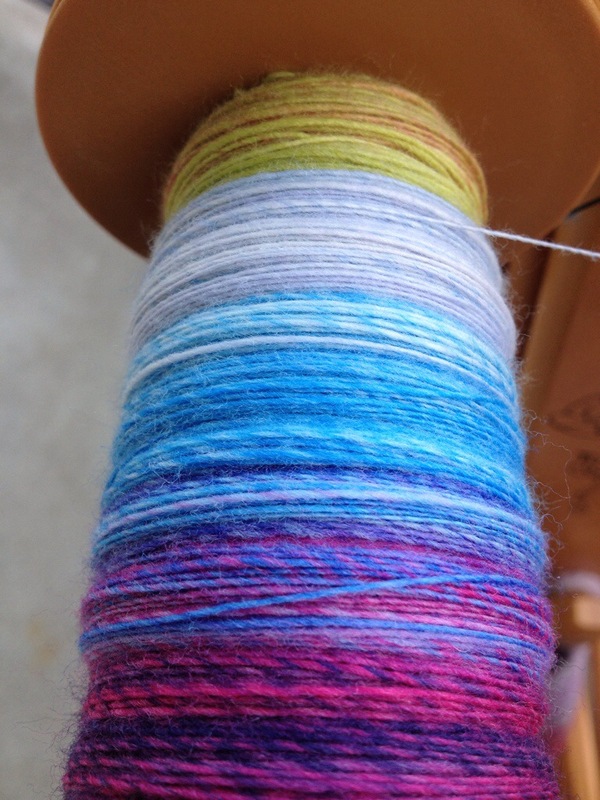 Once I had my hawser ply skein of yarn, I’d run my hands through it and be so impressed with how a balanced yarn could have so much energy running through it. The yarn just felt alive, totally different from my regular yarns. So fun, and it just called out to me to be knit with. I couldn’t help myself, I balled it up right away. Of course, in ball form, all the energy is subdued and it no longer felt all that impressive. Very disappointing. However, I’d already committed to knitting a cowl with it, so I cast on. Yesterday I didn’t expect to have much in the way of crafting time. I was headed out to watch Mr. Ink and his buddy bowl in their league. I’ve done so a couple times, but never stayed through the entire thing. Thankfully I had my just cast on project in the car, as Mr. Ink said “This can get boring, I really do hope you brought something to do!” So I knit while they bowled, and I got an amazing amount done. As it turns out, the yarn has a ton of energy when knit as well, it feels like the trapped energy has the stitches looking really popped and nicely defined. Very interesting. I can’t wait to continue! 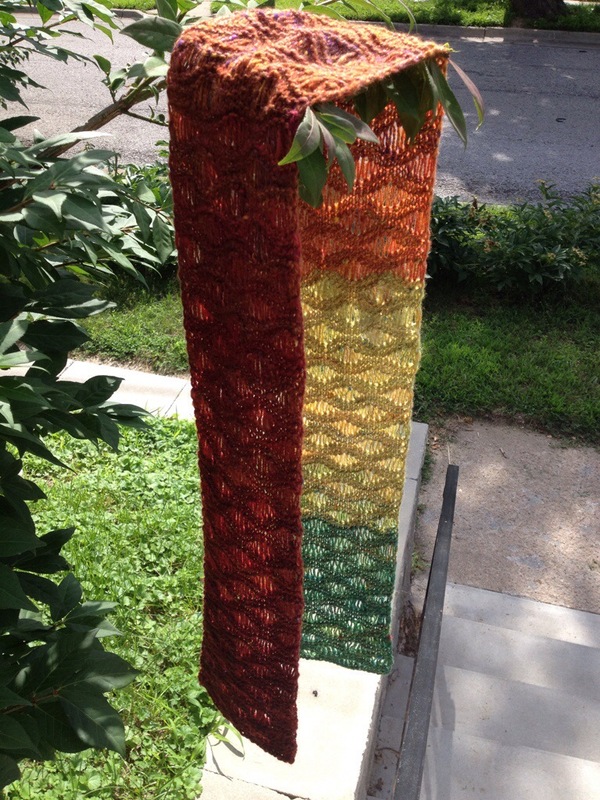 Of course, now I want to make my cabled yarn, and knit it into something similar to see how they compare. As I mentioned in a previous post, I’ve chosen my next fiber and project from A Spinner’s Book of Yarn Designs. I focused on a beaded chain ply. I split the fiber in half, assuming that it would be easier to handle that way, but there’s no telling, I might need to split it more once I get started on the chain plying. For now, this seems like a good start. After a somewhat crappy day at work yesterday, I left work only to realize that the day was glorious! Not as humid, significantly cooler, and sunny. So, I grabbed my wheel and a glass of wine and did a bunch of spinning on the lawn. The above picture was where I started, and I worked all the way back across the bobbin through two more colors. After that, I decided to head inside and be a bit more productive, before Mr. Ink made me dinner. Spoiled, I am. I also managed to finish my latest drop stitch scarf, which should be appearing on the blog once it is washed and blocked, and I wound the hawser ply yarn because I just cannot wait to play with it! Exciting summer crafting days! I am done! Done done done! And I think it went pretty well overall. 8 oz of The Dyeing Arts superwash merino duos in Goblin Seas. I ended up with 360 yards of hawser 4 ply yarn. I washed it and finished it yesterday, and then hung it out to dry. 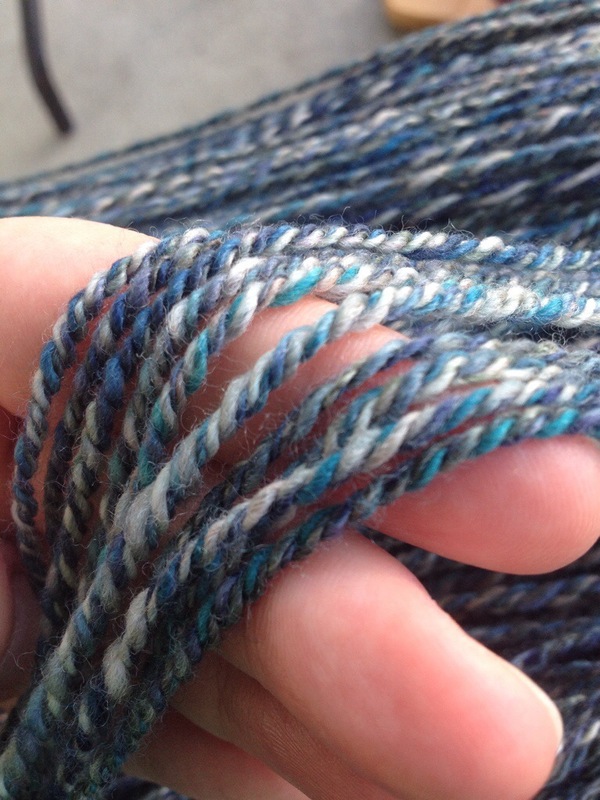 I couldn’t stop going outside to look at it, so bouncy and beautiful was this skein of amazing and unusual yarn. I’d call it a smashing success. In fact, I am almost done knitting the second drop stitch scarf, and I am fairly certain this yarn is going on the needles next. I’ve managed to even find a fabulous cowl pattern for it. This whole expanding my spinning horizons really seems to be working for me! I finished my hawser ply yarn yesterday, but didn’t get an opportunity to skein it before my evening activities. So, I didn’t get a chance to skein and wash it until this morning. Which means it is FAR too wet to show off. I then decided to attempt spinning some of my cotton on my wheel, but that quickly bored me. I needed something else. So, I pulled out my Spinner’s Book of Yarn Designs and did a little searching for my next broadening the horizons endeavor. I marked a few possibilities, and then went stash diving. Into my BEADS! Yes, the next wheel spin I do is going to involve beads. 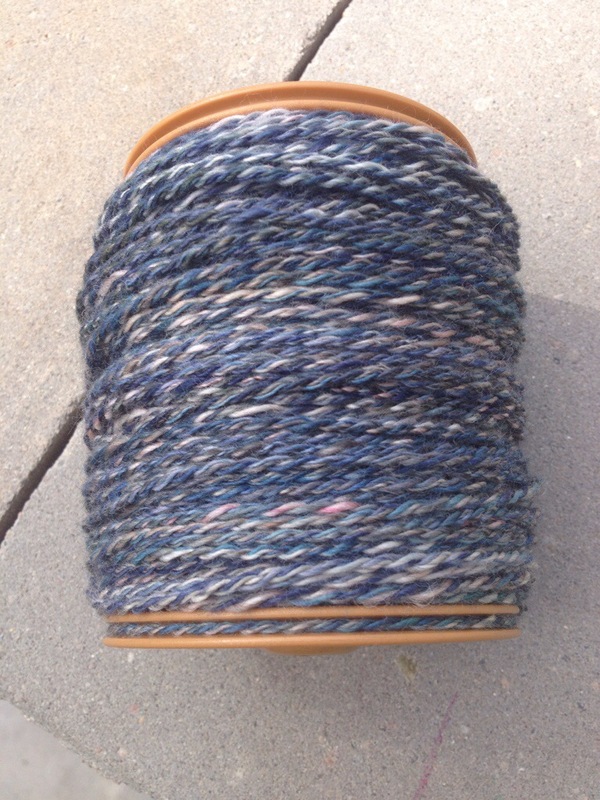 The fiber is rambouillet from Spun Right Round fiber club. For this one, I’ll be spinning a single, stringing the beads on it, then chain plying, and adding a bead to the chain bump as I go. I also dove into my fiber stash as well, looking for the fiber for the beads, and I also pulled out a few things that I intend to work on during Tour de Fleece. 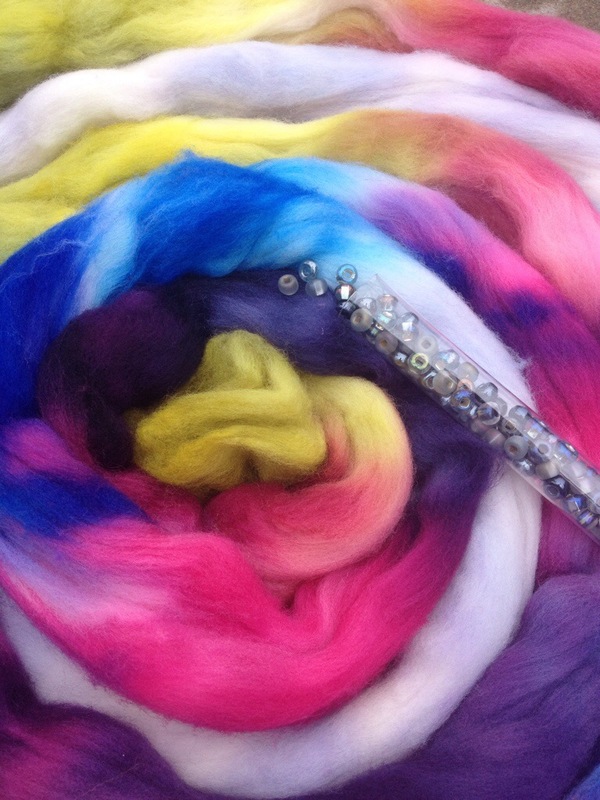 I’ll be spinning on the Dyeabolical team, and thus will be making sure to use some of my dyeabolical fiber. I’ve got 8 oz. of a pink, and am thinking of making a cable yarn out of it. Should be enjoyable. Well, not precisely. But, a day of being in my own space, quietly, no matter how busy it got. So, it is restful. My plan was to get up fairly early and mow, then do yard work, while the weather was still cool and comfortable. But, we got a major surprise storm that just sort of sat over our area most of the night, causing massive amounts of water in basements and some flooding in various areas. The rain was intense! I had to run to my car in it when it began, and I ended up looking like I’d just jumped into a pool. I wasn’t even out in it 30 seconds. Needless to say, it was still far too wet this morning to consider mowing. Instead, I decided to tackle the yard work. I had some vines growing, and Mr. Ink was concerned one of them might be poison ivy. He’s highly allergic, and I’ve never had it. So, I yanked those out. Then I proceeded to yank out all sorts of weeds and grasses in my garden, and some junk trees trying to take hold around the yard. It was the perfect day for it, the ground being so saturated that those junk trees came out roots and all (and I measured, some of the roots were 3 feet long! 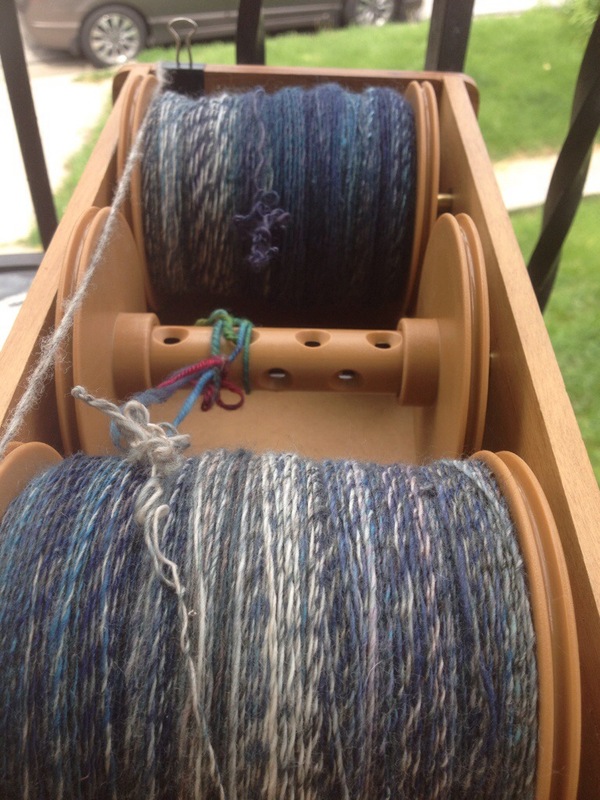 But, because I didn’t have to mow, I had extra spinning time! And since it was still cool and comfortable, I could do that spinning on the porch. So I pulled out the hawser ply project. When I’d left it, I was working on the final 2 oz. of a total of 8 oz. I had to finish that, then ply 4 of the oz. together. 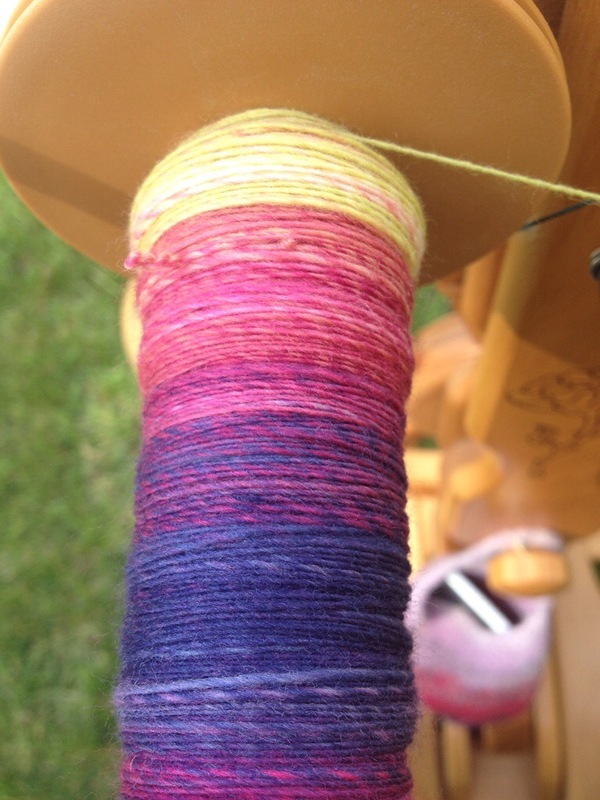 Since this plying was in the same direction as I spun the singles, they are all squirrely and difficult to control. But, then, I ply both those two plies together in the other direction to create the hawser ply yarn. Do you want a sneak peak? Because I’ve gotten one bobbin finished. Of course it still needs to be washed and set, but I won’t be bothering with that until I am done plying. Hopefully tomorrow. My observations thus far? It’s amazing to me that a 4 ply can so closely resemble a 2 ply. The 2 plies are so comfortably meshed that they resemble just one ply. Of course, this could all change during a washing, so I’ll wait to see how it all shakes out. But, I must say, it’s pretty exciting! I am loving trying something new. It inspires me to continue to along these lines for added inspiration.